On October 19, 2018 Earth was grazed by a small asteroid that entered within the ring of geosynchronous satellites orbiting the planet. 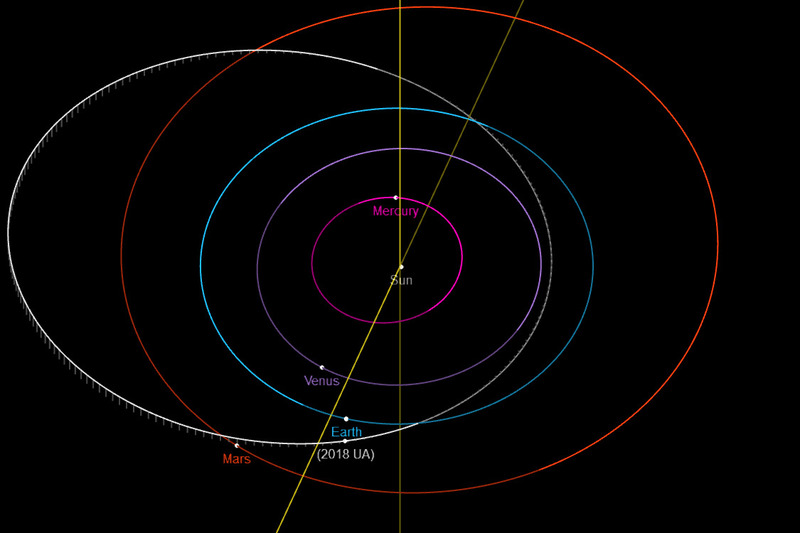 The near-Earth asteroid designated as ‘2018 UA’ was discovered by the NASA-funded and University of Arizona based Catalina Sky Survey on the night of October 18, 2018, a mere 10 hours before its closest approach to the Earth. 2018 UA is estimated to be 3-4 meters (10-13 feet) across and traveling at a velocity of 14 kilometers per second (8.8 miles per second) relative to Earth. At its closest the space rock was only 7,300 to 15,350 kilometers (4,500 to 9,500 miles) above the Earth’s surface, yet at no time did the asteroid pose a threat to the planet. Objects of this size entering near-Earth space are not rare and are known to actually impact the Earth about once or twice each year. However, most such objects disintegrate quickly and burn up in the upper atmosphere without significantly affecting the surface. Occasionally, for impacting objects of this size, some small fragments might harmlessly reach the surface or drop undetected into the sea. In any case their hypervelocity impact with the Earth’s atmosphere will produce a fiery light show for anyone fortunate enough to witness. This was not the fate of 2018 UA which departed near-Earth space as quickly as it appeared receding outwards toward the distal end of its orbit beyond Mars. It’s likely that the cosmic travels of this small asteroid will someday end in an inconsequential impact with the Earth, the moon, or possibly Venus or Mars. Until then the Catalina Sky Survey and other observatories across the globe will continue to track 2018 UA and other near-Earth asteroids like it. For more information on 2018 UA, listen to the Travelers in the Night podcast.